The wonderful thing about Italian food is that there are as many variations as there are Italian families, each variation as equally precious in their own way. This summer I spent a day working in the kitchen of chef Algelino Sicilano (how perfect that he should be named after his island of his birth). Angelino makes pasta in the simplest of ways, using just Durum wheat flour and water, that’s it; no salt, no oil and definitely no eggs, that’s a luxury for the rich northern Italians. 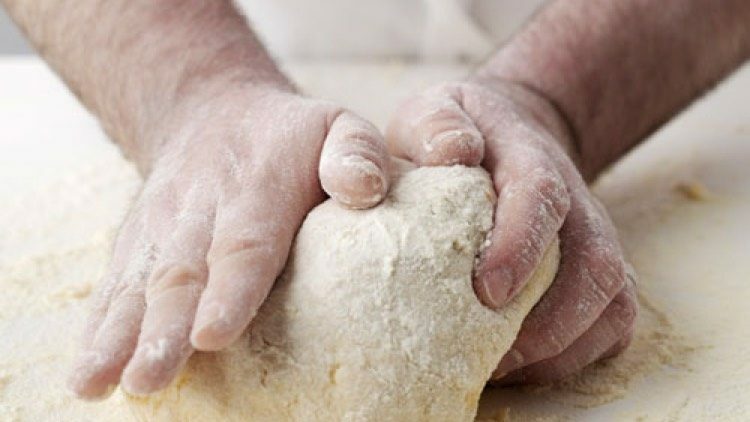 His preoccupation wasn’t the amount of water used or kneading the dough by hand but rather the temperature of the dough. The minute the temperature topped 28 degrees it went straight into the fridge. As you can imagine his favourite kitchen gadget was his infrared temperature probe. The dough was kept airtight for as long as possible with only small amounts of this precious dough unwrapped at a time. Durum wheat when ground to a flour is stronger, more coarse and amber yellow unlike the refined pure white flour we know. In Sicily it’s called semola (not to be confused with semolina, a completely different animal). I had to prove my foodie credentials to Angelino, which was not easy with someone who didn’t speak a word of English. I studied in Rome for a while so my Italian is patchy and more like Latin to be honest, but between us and with generous use of facial expression and tone of voice, we understood one another pretty well. When two or more foodies are in a room talking about food there is an energy, an enthusiasm, a passion which is electric and contagious. With this energy comes a desire to talk and share knowledge. Angelino was a generous man and as well as the things he promised to share he also gave me his mother’s recipe for Sicilian tomato sauce, grossini, focaccia and chicken in a bun (only joking!). He gave me his recipe for cannoli, which is probably my favourite food from Italy and I’m simply not sharing that with anyone (you’ll have to ask for an invite to supper if you want to experience those).